Pregnancy brings many questions in people's mind, varying from what kinds of food to eat, when to ask for maternity leave, which exercise to do and how much sleeping is needed. Besides all of these, sometimes pregnant women want to or have to travel on an airplane. In this case, one most common concern is the safety of flying during pregnancy, especially during first trimester. Is Flying During First Trimester Safe? First trimester is a very crucial stage in pregnancy during which your baby's organs start to grow and marks the beginning of fetal development. In this stage, pregnancy related changes begin such as swollen hands and feet, increased frequency to pass urine, morning sickness, fatigue and craving for food. 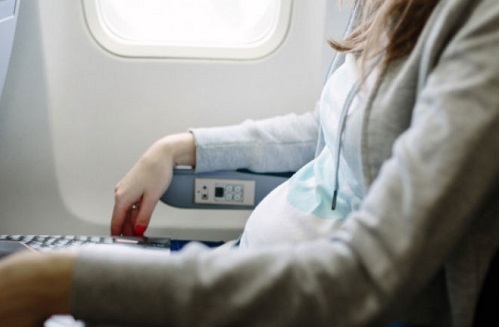 With all the changes, can pregnant women stay safe when flying during first trimester? Throughout your pregnancy, second trimester is the best timing to take an airplane. In this trimester, morning sickness usually eases; a woman becomes more energetic and comfortable with all the pregnancy changes; and the risk of miscarriage and early labor is the lowest. What's more, the abdomen is still small and bladder pressure hasn't increased as experienced in third trimester. Flying during first trimester can bring anxiety to many. But with few appropriate measures the journey can be made safe, smooth and comfortable. Who wouldn't like some extra pampering with a little up gradation to business or first class, giving some extra leg space? Even if it's not possible, one can expect a stress free travelling by these simple measures. If possible, it's better to get a seat of choice by online check in. Being pregnant and rushing through check-in and security will definitely cause discomforts. Hence, in case online check-in is not possible, arriving at the airport early enough surely helps. Comfortable dressing is always advised. Wear lightly layered, loose fitting clothes that can be taken off easily in case it gets too hot. What's more, comfortable shoes while flying is also very important so as to avoid feet swelling caused by cabin pressure. Seatbelt should be adjusted under the bump and across the pelvis. Seatbelt extenders are available on board in case it's too small. Maintain hydration by drinking plenty of bottled water and fruit juice. While flying during first trimester, try to take an aisle seat whenever possible. It allows you to take short strolls and frequent bathroom breaks, and gives an extra space for legs. Above all, try to relax and enjoy the trip. In case a woman finds an empty seat next to her, slipping shoes off and putting feet on it add a little comfort. Due to less moisture in cabin air, dehydration can occur during flying. Hence, it's suggested to keep a bottle of water with you and sip from it regularly. As the risk of varicose veins and blood clots is high while flying during first trimester or even throughout pregnancy, wearing compression stocking is always a good idea to keep good blood circulation. They should be worn before a woman gets out of the bed in the day of flight until she goes back to the bed after flying. It is important to remain active to keep blood circulation moving. Swelling of feet and ankles, and leg cramps can occur if a woman remains inactive or sits for longer periods. Walking around for three to four minutes every hour is helpful. Risk of blood clots can be avoided or decreased by simply walking down the aisle and doing some simple stretches. Any tenderness, soreness, swelling or redness in any of the legs should seek medical attention as it could be sign of blood clot. Simple exercises help relax the calf muscles, like stretching legs out, gently flexing feet, rotating ankles and wriggling toes. Besides, you can roll the shoulders in both directions, drop the ear to shoulder and slowly roll the head back and forth. Repeat these exercises for ten times. How Early Can You Get Morning Sickness? How Is Endometriosis and Pregnancy Related? Can You Be Pregnant and Not Know It? What Does It Mean to Have Excessive Progesterone? Why Am I Lactating While Pregnant? Can Implantation Bleeding Have Small Clots?